Steve Bethea moved around the field for short-season Spokane in 1989. By mid-July, he'd played five different positions for the team and had success, according to The Spokane Chronicle. In one July game, that success came as a center fielder and it took the form of a spectacular diving catch, The Chronicle wrote. "I just ask him, 'Have you played there?' He says, 'I can play there,'" Spokane manager Bruce Bochy told The Chronicle. "Wherever I put him, he looks like he's been there all his life. He's a very valuable player to have on a club." Bethea was fresh out of college that year. He went on to play in six professional seasons. His utility got him to AAA. He never made the majors. 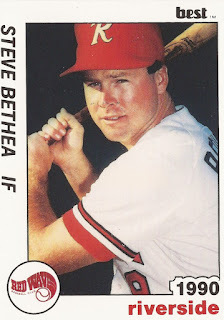 Bethea joined the Padres system at Spokane in 1989, having been taken by San Diego in the 26th round of the draft out of the University of Texas at Austin. At Texas, Bethea helped the Longhorns to the title game, hitting a home run in the process. With the Padres, Bethea played that first season at Spokane. He got into 62 games, hitting .219, with one home run. He hit that home run in early July, a grand slam. Bethea scored the winning run in a June game, bowling over the catcher on a play at the plate. "I kind of glanced up and saw where the throw was," Bethea told The Spokane Spokesman-Review. "I don't think I'd have been out. He'd still have had to hold on when we collided. But luckily, it's a tough throw to handle." Bethea moved to high-A Riverside for 1990. He hit .171 there over 104 games. He played mainly at shortstop, but he also played at four other positions. He made AA Wichita for 1992 and hit .249, then saw 39 games at AAA Las Vegas in 1993. He saw 54 total games that year and hit .218. In one game that year, he unsuccessfully faced Todd Van Poppel. "This guy just throws too hard," Bethea said after one of his at bats against Van Poppel, according to The Los Angeles Times that June. Bethea's final season came in 1994. He played in 29 games between high-A Rancho Cucamonga, Wichita and Las Vegas, ending his career.